Plans are in place to create a 15-acre development along the Ohio riverfront and residents and business owners in Chateau are having mixed reactions. A laid-back warehouse district on the west side of state Route 65, Chateau’s story is one of highs and lows. Once united with neighboring Manchester, Chateau used to be home to thousands of Northsiders. The area changed with the construction of state Route 65 in the early 1960s, which separated the two almost completely. By 1970, the population west of the highway had dropped below a thousand. As of the 2010 Census, just 11 people still call Chateau home. Chateau’s fortune seems to be changing in a hurry, however. 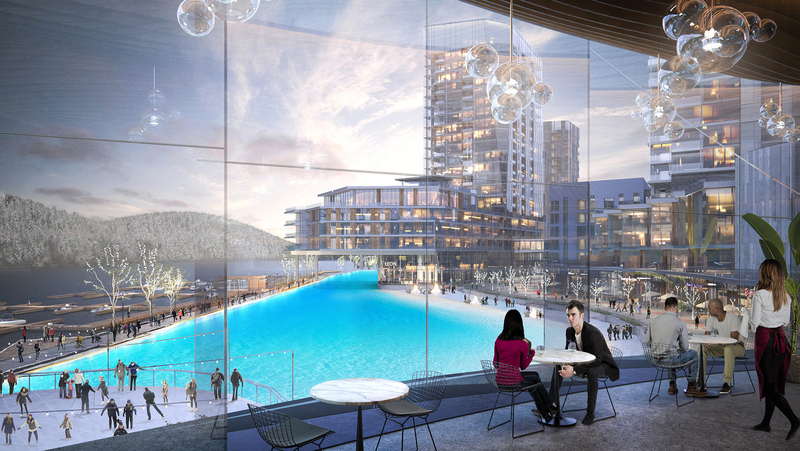 Multinational development company Crystal Lagoons recently announced their partnership with local firm Millcraft Investments to create Esplanade, a 15-acre development along the Ohio riverfront. According to Peluso, the new development will also include 700 new residential units, as well as over 300,000* square feet of office space. It will utilize the Ohio River for a number of purposes, and the riverside trail that currently exists will be extended and improved as part of the development. Groundbreaking for the project is expected to begin in 2020.
expected to begin in 2020. Photo courtesy of Crystal Lagoons. While sparsely populated, Chateau does have a community of businesses still operating in the area. The RJ Casey Industrial Park is a building that houses three of the neighborhood’s key players. A pair of museums occupy the building, the first being Bicycle Heaven, the largest bicycle collection in the world, with over four thousand bikes. The second is Johnny Angel’s Ginchy Stuff, a collection of music related memorabilia from the close to 50-year career of owner and rock musician Jack Hunt, known as Johnny Angel. Upstairs, above the museums, is Get Hip Recordings, a collection of thousands of vinyl records, cassettes and CDs available for sale. Founded by Gregg Kostelich, Get Hip also functions as a record label, signing its own artists and producing and selling their records. The store also hosts live performances on its upper level. Down the street from RJ Industrial Park is the Chateau Cafe & Cakery, one of the only food establishments west of state Route 65. It provides a peaceful coffeehouse environment with light food, coffee and of course, cakes. For the owners of these businesses, a large-scale development program in the Chateau region is not necessarily a surprise. during June 2018 in order to open a dialogue with affected business owners. The community response was generally positive. The reaction to the development itself, however, has not been uniform. Some see the new investment as a net positive for the neighborhood, bringing in more permanent residents as well as passing foot traffic and tourists. Morrow echoed Angel’s optimism about the project, saying he’s already noticed a slight increase in foot traffic, and is hoping the Esplanade development will increase this. He did express concern, however, for increased vehicular traffic in the area, because Beaver Avenue, a main thoroughfare in the neighborhood, is a one-way street. There are concerns, however, about the future of what already exists in Chateau. Kostelich, for example, worries that future development may soon encroach on the RJ Casey Industrial Park, forcing him, Bicycle Heaven and Johnny Angel’s out. On the other side of Route 65, residents of Manchester are also worried about the future ramifications of this development. Amy Welch, president of the Manchester Historic Society, said that while she and others are “cautiously optimistic” that the project will be a positive influence in the area, residents are concerned about the effect it could have on parking. “We’re concerned that if many people are attracted to that area, they will choose to park for free in the neighborhood, rather than in the parking garages,” Welch said. From a long term perspective, there is also fear that the new development could lead to an increase in property values for the surrounding area. “We want to make sure any spillover development still protects the fabric and character of the neighborhood, and we don’t want people who have lived in the neighborhood for generations to feel like they’re being priced out of their homes,” Welch said. Once it’s complete, there’s no doubt that the Esplanade development will completely change the face of Chateau. The community is optimistic that the new lagoon will be the beginning of Chateau’s next upswing. “Everybody wants to rent here now. I really believe [Chateau’s] gonna be the next hot spot,” said Morrow. * A previous version of this article stated that the new development will include over 30,000 square feet of office space. The correct square footage of the office space will be over 300,000 square feet. Updated on 11/14/2018.